Oculus has revealed the 30 titles that will be available when the Rift becomes available later this month. 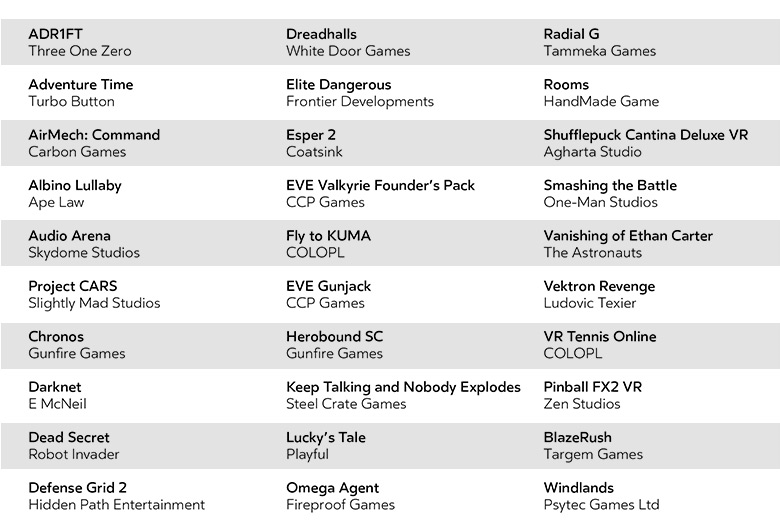 30 games will be available for the Oculus Rift when the headset arrives on March 28, including Eve: Valkyrie, Adrift, Defense Grid 2, and Keep Talking and Nobody Explodes - which our team loved when they tried it out at PAX Prime 2015. According to Oculus, the lineup represents "years of work from a global community of developers who are pioneering the future of VR." "These games take you to the outer reaches of space, mysterious labyrinths of wonder, and fantastic worlds of adventure. And they're just the beginning," a blog post reads. "We're working with thousands of developers on entirely new VR experiences. There are over a hundred more games coming to Oculus this year."